Step1: The Victim connect to secure Bank websites and logs into his account. Step2: A cookie set in the Victims browser containing the session id of the victim. Step3: Victim trips into visiting a malacious page. Step4: Victim recieves a html page containig malacious hidden form. Step5: A web request is executed from the victims browser carrying the context of cookie set in Step2. Step6: Bank Server completes the web requests. Conclusion: Banking server failed to verify the validity of the web request and hence executed it without the victims knowledge. 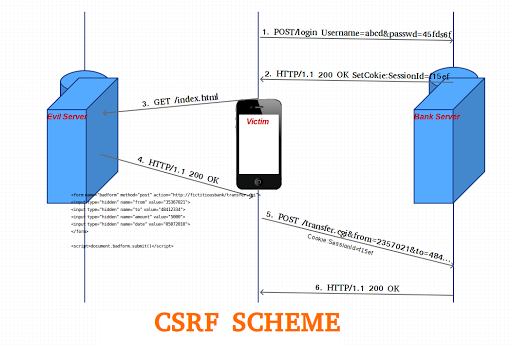 Now we know what CSRF is, lets see how Rails help prevent CSRF. This can be enabled with the protect_from_forgery method, which will perform the check and handle unverified requests, if the token doesn’t match. And it will add a _authenticity_token parameter to all forms that are automatically generated by Rails. It is recommended that this method is added in your ApplicationController, and later on you can skip it in other controllers if not required. With all this in mind lets take a look at Rails source code. From the code, we figure out, CSRF protection resets session and lets the request through when CSRF token verification fails. With Rails 4 application, the ApplicationController now passes a parameter to protect_from_forgery. This raises an exception when an unverified request is encountered. Same behavior can be achieved with Rails 3 by overriding the default handle_unverified_request method.